Recently, I joined two of my girlfriends, sweet sisters of the faith, around a table one evening at a nice restaurant. We sat there drinking our decaf coffee and eating delicious dessert. As the conversation was going along, I confided with them about an internal struggle that I have been having for a while now. I told them I was finding it difficult trying to navigate through figuring out how to do the right thing even when every thing inside of me was screaming differently. Life is hard, isn’t it? Doing the right thing can be so difficult sometimes. Yet the alternative only leads down a path of guilt and shame. On a warm Sunday evening back in June 2005, my husband and I went to an evening church service. That night, the Pastor started his sermon with an opening line that went like this, “This summer, we will all find ourselves going on a trip. It is called a guilt trip.” Ten years later, I still remember that sermon and I knew that God was speaking directly to me through every single word. It profoundly impacted a decision I made later on that very night. While it wasn’t without pain, I realized that being stuck on the guilt trip of life is not somewhere that I had to keep going. Guilt wasn’t the lifelong companion that I thought was a consequence I had to take to my grave. That same Pastor, during another sermon on a Sunday morning, made this comment, “If anyone of you knew the thoughts that would go through my mind, you would fire me on the spot.” Not a single person in the sanctuary moved and his honesty floored me. Yet, it was a statement that spoke such hope to my soul. It doesn’t matter who we are or where we are in life. We are ALL sinful. We ALL struggle. However, I believe it isn’t the struggle that makes us sinful people, but how we react to those struggles is what matters. Put guilt where guilt belongs, but don’t pack your bags and haul it with you because you find yourself struggling to seek to do the right thing. As I told my girlfriends the other night, the only thing I have found that it really boils down to is seeking Christian council, praying to God for wisdom, and asking Him for the courage to respond when I feel the Spirit leading me to do the right thing. Left with my own strength, I am almost guaranteed to fulfill the desires of my flesh. You know what? We are all going to fail and make mistakes, but in Christ, we are free to do that! There are days when we are going to make the wrong choices, we’ll feel the consequences, but we can stand back up and try again. We don’t have to rely on our performance in this life to earn us favor with God, for in Jesus, we already have it. That is what grace is all about. The best part is, the Spirit that lives in us, the very same Spirit that raised Jesus from the dead, we don’t have to struggle to be free from the guilt and shame that those mistakes can cause us. We are forgiven through what He has done for us. I want to end with a song by Tenth Avenue North, “The Struggle”, and if you have a moment please listen to it. It nicely sums up what I am trying to say. Friends, at the moment I find myself in a place of great struggle! 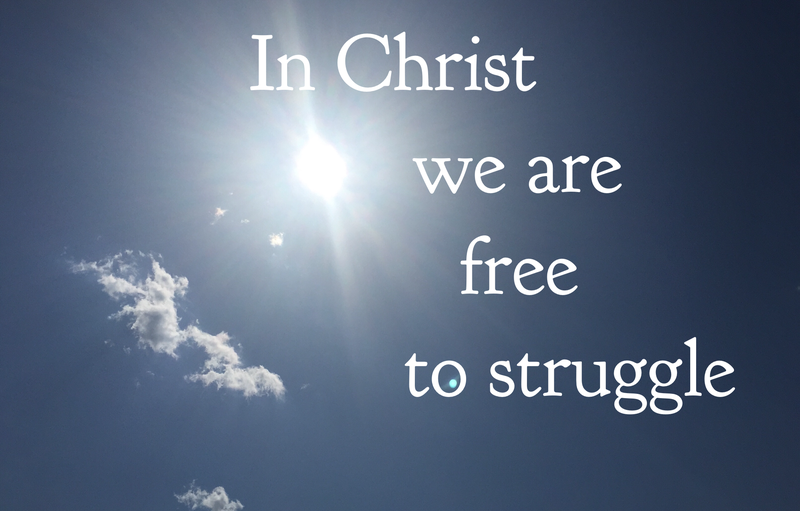 But Hallelujah – I am free to struggle, but not struggling to be free.